When it comes to Jerry’s Underground Garden Salon in East Somerville, it is anything but typical. Located on Tufts St in East Somerville, Jerry opened his salon three and a half years ago incorporating his hobbies of gardening and bird watching into his professional life of owning and managing a hair salon. He built his salon in the back of a house overlooking the patio and the backyard. He made sure the windows faced the sun and installed doors to the patio that he opens in the summertime to extend his salon into the outdoors. Jerry’s yard became the first certified backyard wildlife refugee in Somerville, and with good reason. The landscaping caters to all 4 seasons, but especially Spring and Summer when his flowering trees are in full bloom. His backyard is home to over approximately 50 different kinds of trees, shrubs, vines and flowers including 3 kinds of Holly, Winterberry, Cherry Blossom, Dogwood, Magnolia and a myriad of others. Jerry’s ultimate goal in all of this is to bring nature into the cities, and he has done just that. Within 5 minutes of being in the Garden Salon, Jerry pointed out a Goldfinch, a Cardinal and a Snowbird at his bird feeders and in the trees, which are not birds normally spotted in the city. The definition of a green salon really takes on a whole knew meaning at Jerry’s. Windows pointed towards the sun that open onto the patio. So what does he like about East Somerville? For one, he says his heart and soul is in East Somerville. He has lived here his whole life and raised his daughter in the neighborhood as well. He also remarked on the freedom he has to develop his land for the customer and the business itself, instead of for profit which is commonly found among city real estate. He said if he attempted to have a salon with an outdoor patio and walkway into the garden like he does now in a different area, a developer might see it as a waste of money since it could potentially fit more businesses. This way he can offer his customers flowers, trees, animals and potentially even a fountain down the road…in Jerry’s mind the possibilities are endless. Jerry mentioned that years ago East Somerville didn’t have a very good name, but the city has changed dramatically. He opened his salon here to be one of the many amenities the neighborhood offers and is especially excited for all the upcoming changes from the Green Line to the Streetscape projects. Jerry standing in the yard in front of his Forsythia tree. Before his salon in East Somerville, he had a location in Harvard Square which was a popular spot especially among the local college students. While he didn’t have the same nature theme, he worked to create a relaxing and welcoming environment away from the stresses of the universities and work life. He said it wasn’t just about a good haircut, it was about the atmosphere. 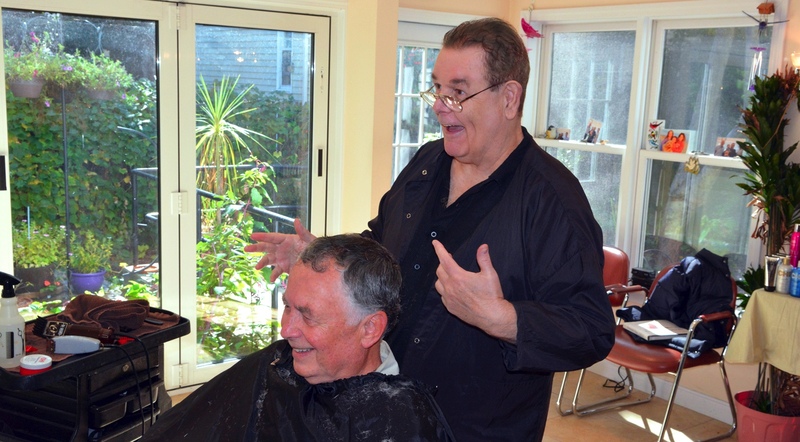 Jerry definitely succeeded in doing so as he saw the President of Greece’s son, Joy Baher from the View, Ted Denato of the Bruins, and numerous other big names come to him for hair services. At the Harvard Square location he was the only “one-man shop” which gave a friendly air to the place and gave him a chance to really get to know his customers. He also began using eco-friendly products from California that contained no ammonia and no bleach, which appealed especially to his environmentally-conscious customers. He has carried these two aspects over to his East Somerville location, and with the addition of the gardening/bird watching theme, Jerry has created quite a unique salon. Jerry began his hobby of bird watching and gardening about 40 years ago which led him to do a lot of work in the neighborhood planting trees and plants. 35 years ago, with the help of neighbors, he planted 500 trees to landscape a business on Tufts St. He received two neighborhood council grants to landscape the Railroad tracks with evergreens and various plants in order to attract wildlife to the city. Jerry worked on Glen Park, the East Somerville Community School, the Capuano School, Union Square, the McGrath Highway as well as parts of Washington St. to plant trees. Final piece of wisdom to take away from Jerry?